The U.S. Air Force and Norway have completed several weapons development tests for the fifth-generation Joint Strike Fighter‘s anti-surface warfare missile system. Norway will proceed with the integration and evaluation of the Joint Strike Missile after it has matured through ground, captive carriage and live-drop tests at Edwards Air Force Base, the service branch said Friday. Raytheon partnered with Norway-based defense company Kongsberg Gruppen to develop the JSM for the internal weapons bay of the F-35A Lightning II aircraft. 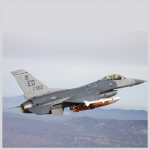 Test activities at Edwards AFB involved inert JSM variants loaded onto the F-16 Fighting Falcons prior to the final flight test, which included target neutralization using full-mission guidance and software systems. Testing began at Edwards AFB in 2015 with the first JSM variant including an active autopilot and a glide-only weapon. Flight tests of different versions of the JSM helped determine the independent power and navigation of the missile at extended operations. The JSM features an infrared imaging seeker enabling autonomous target recognition for long standoff and distance anti-ship operations.